MID congratulates State Deputy Fire Marshal Jonathan Owens, Northern District for being named a 2017 Top Cop in ceremonies today (05/18/2017). Pictured with Owens, center, are Chief Deputy Fire Marshal Ricky Davis, left and Northern District Deputy Supervisor Mike Ivy, right. 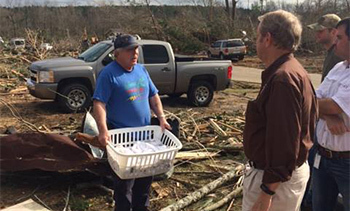 Commissioner Mike Chaney and MID staff on the ground in the Hattiesburg/Petal area assessing damage. Mississippi State Fire Marshal deputies and Mississippi State Fire Academy assisted in search and rescue. 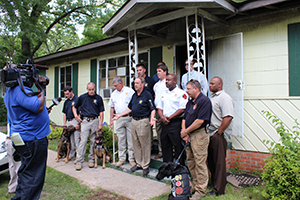 Mississippi State Fire Marshal deputies continue to assist local authorities in protecting lives and property. Congratulations to State Fire Academy Reggie Bell, left and Chief Deputy Fire Marshal Ricky Davis, right and the staffs of the Mississippi State Fire Academy and the State Fire Marshal’s Office on receiving recognition of their work with the Mississippi Burn Camp Foundation. 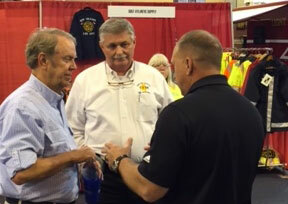 Commissioner of Insurance and State Fire Marshal Mike Chaney, left and Chief Deputy Fire Marshal Ricky Davis, center attended the 79th Mississippi Fire Chiefs and Firefighters Conference in Natchez today(6/3/16). 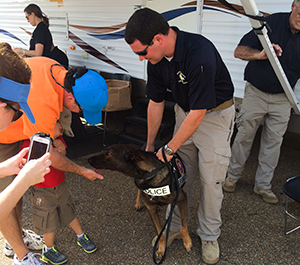 Chief Deputy Fire Marshal Ricky Davis and Mississippi State Fire Marshal Deputies were on hand to assist attendees. 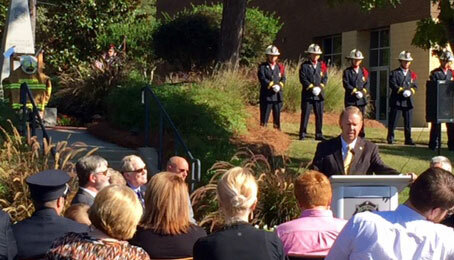 As the Honor Guard looks on, Commissioner Mike Chaney speaks at the annual Fallen Firefighter Memorial ceremony this morning(10/6/15) at the MS State Fire Academy. Congratulations to new State Deputy Fire Marshal Jason Davis on his graduation from the state Law Enforcement Academy. 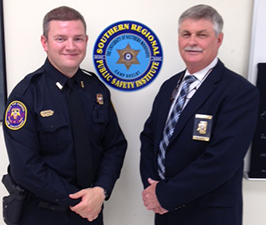 Pictured with Deputy Davis, is Chief Deputy Fire Marshal Ricky Davis. 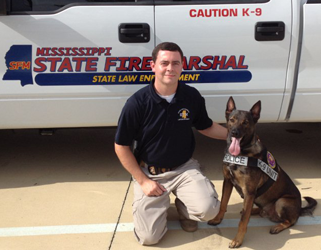 All state fire marshal deputies are Certified Law Enforcement Officers in the State of MS.
Mississippi State Deputy Fire Marshal Kevin Martin and Arson Dog Sita Won 1st Place in Accelerant Detection at the United States Police Canine Association (USPCA) National Detection Trials held this week in Jackson, MS.
Make-A-Wish ‪Recipient Bryer Floyd joins Commissioner of Insurance and State Fire Marshal Mike Chaney at the opening session of the Mississippi Fire Chiefs and FireFighters Conference in Tupelo on May 30, 2015. 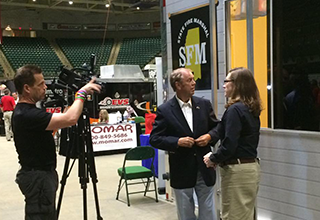 Commissioner of Insurance and State Fire Marshal Mike Chaney visited the State Fire Marshal's Fire Safety House on display at the 78th Annual Mississippi Fire Chiefs and Firefighters Conference in Tupelo, May 30, 2015. 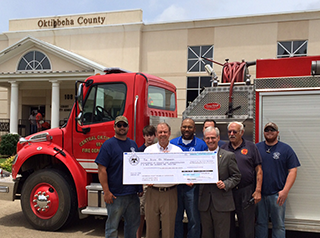 Today the Oktibbeha Board of Supervisors received a check for the purchase of a new fire truck through the Rural Fire Truck Acquisition Assistance Program presented by Commissioner/StateFireMarshal Mike Chaney. Pictured are: from left - Sam Pennell-Central Oktibbeha VFD; Mason Brown; Commissioner Mike Chaney; Orlando Trainer-Oktibbeha County Board of Supervisors; State Senator Gary Jackson; Chief Joe Pennell (behind Jackson); A.K. Rosenhan, County Fire Services Coordinator and Brent Moore-Central Oktibbeha VFD. Commissioner of Insurance and State Fire Marshal Mike Chaney commended the work of State Fire Marshal Arson Dog Sita and Brutus, Arson Dog for the city of Jackson Fire Department. In recognition of May 3-9 , 2015 is Arson Awareness Week – the 2015 theme is Accelerant Detection Canines – Sniffing out Arson. 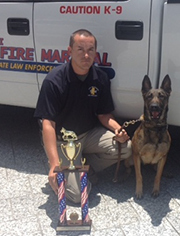 State Deputy Fire Marshal Kevin Martin and his partner, Arson Dog Sita. 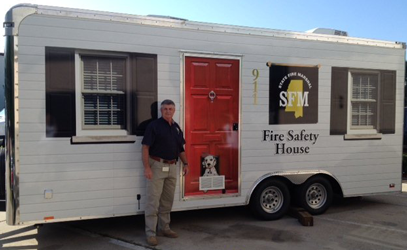 State Chief Deputy Fire Marshal Ricky Davis with the new Fire Safety Trailer that will be used as a fire safety training tool at schools, conventions, festivals and other events. Deputy K-9 Handler Russell with Ringo, SFM Bomb Detection K-9. 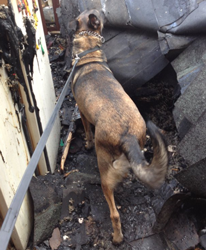 Sita – State Fire Marshal's K9 Accelerant Detection. Deputy and K-9 Handler Russell with K-9 Ringo, Bomb Detection. Chief Ricky Davis has served as the State Chief Deputy Fire Marshal since July 2006. 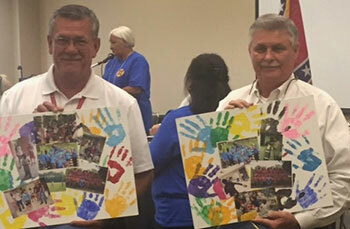 As State Chief Deputy he also oversees over 50 employees in seven Divisions: Fire Investigations, Fire Code/Enforcement, Factory-Built Home, Mississippi Electronic Protection, Public Fire Safety Education, Fire Services Development and Liquefied Compressed Gas (all Divisions are part of the Mississippi Insurance Department). Ricky joined the Mississippi Department of Insurance State Fire Marshal’s Office in July 1990, as a Deputy Fire Marshal in Fire Investigations and was later promoted to Assistant Chief Deputy Fire Marshal Supervisor of the Southern District of the State. He worked with the first accelerant sniffing canine in the State. 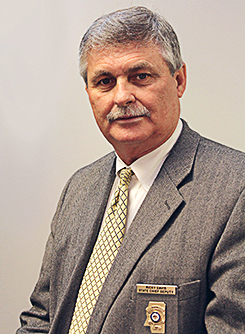 Chief Davis’ prior employment was with the Jefferson Davis County Sheriff’s Office where he served as Chief Investigator and County Fire Investigator/Coordinator. He was instrumental in creating the first rural volunteer fire department in Jefferson Davis County. He also served as Fire Chief of this newly created volunteer fire department and was also the first President of the Fire Chief’s Association of Jefferson Davis County. 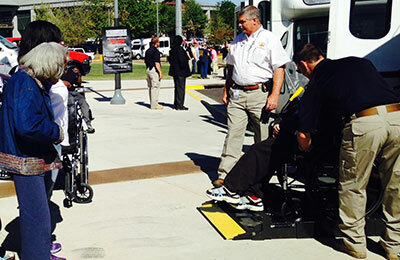 Under Chief Davis’ guidance programs were established and implemented in the Fire Safety Education Division, which was created by the Mississippi Legislature. 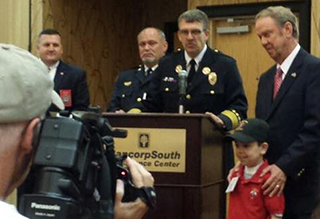 Through this Division Chief Davis has been a champion of the Smoke Alarm Program for the State. The program is designed to provide smoke alarms to be installed in low income homes throughout Mississippi. He was also instrumental in getting the passage of the Fire Standard Compliance Cigarette Law, designed to decrease the amount of fire deaths that occur due to careless smoking, the Novelty Cigarette Lighter Bill and the Mississippi Burn Injury Reporting System. He is very passionate about reducing the number of fire related deaths in the State of Mississippi through educating people on fire safety and prevention. Chief Davis is member of the Mississippi Fire Chief’s Association, Mississippi Fire Fighter’s Association (MFFA), National Association of State Fire Marshals (NASFM), International Association of Arson Investigators (IAAI), County Fire Investigator’s Association of Mississippi , Mississippi Association of Public Fire Safety Educators (MAPFSE), and International Association of Fire Chiefs (IAFC). The mission of the State Fire Marshal's Office is to foster, promote and develop ways and means of protecting life and property from fire and related perils through direct action and coordination with Mississippi fire and law enforcement services. The Commissioner of Insurance is by virtue of his office the State Fire Marshal and shall appoint the State Chief Deputy Fire Marshal. 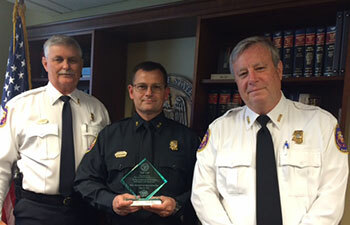 The Chief Deputy Fire Marshal along with other members of his staff have the primary duties of investigating the origin of fires occurring within this State to which his attention is called by the Chief of the Fire Department or other local law enforcement authority of any county or municipality. It is the duty of the Chief Deputy Fire Marshal to investigate or have investigated any fire requested by any party in interest, whenever in his judgment, there is sufficient evidence or circumstances indicating that such fire may be of an intentional or incendiary origin, Miss. Code Ann. § 45-11-1. The State Chief Deputy Fire Marshal is charged with the enforcement of Mississippi Fire Prevention Code, Miss. Code Ann. § 45-11-101, regarding the inspection of all buildings owned by the state or state agencies, places of public assembly and sprinkler systems of high-rise buildings. In addition, the State Chief Deputy Fire Marshal is charged with regulating Manufactured Housing, Miss. Code Ann. § 75-49-1, which requires licensing of dealers, manufacturers, and independent contracted installer/transporters. Also, the State Chief Deputy Fire Marshal serves as the State Administrative Agency (SAA) for the Department of Housing Urban Development for the State of Mississippi. The State Fire Marshal section provides the following information and resources. Click on a link to go directly to a particular topic. Licensing, forms, safety tips, contact information, and more. Duties\Statutory Authority, Application for Special State/Local Inspector, Building Plan Review Request, Mississippi Fire Prevention Code, contact information, and more. Duties\Statutory Authority, Fire Damage Registry for Insurance Companies, Fire Information Request, Civilian Fire Casualty Report, contact information, and more. Fire Safety Education Officers, education and resources, Burn Injury Report, Civilian Fire Casualty Report, contact information, and more. State Fire Coordinator, mission, forms, contact information, and more. Mission, laws and regulations, forms, State Liquefied Compressed Gas Board, PERC Fund, inspectors, contact information, and more. Instructions for obtaining a permit, permit application, and contact information. Rules and regulations, application and forms, Approved CEU Courses, Mississippi Electronic Protection Systems Board, and contact information. FSCC Certification, how FSCC Cigarettes work, how retailers, wholesalers, manufacturers and consumers are affected, resources and more. Licensing for elevator contractors\limited elevator contractors, elevator inspectors, and elevator mechanics\limited elevator mechanics. Online reporting application to track the deaths of firefighters lost in the line of duty and outside the line of duty.